Though they have come away with three tough wins in their first matchups in conference play, Duke has not made it easy on themselves. The Blue Devils controlled the game’s opening minutes against Georgia Tech only to surrender a large run to end the first half and make the game close. They struggled to do so in their matchups with Virginia and Clemson, allowing both teams to take leads in the early going, forcing Duke to fight an uphill battle for the remainder of the first half. Though they were able to tough it out and seize control of the game later on, this is certainly not a habit they want to get into. If Duke is going to jump out to an early lead against Wake Forest, they’ll need to think long and hard about how they approach the beginning of games. Although the Blue Devils have typically relied on outside shooting to put teams away, they have struggled from deep as of late, shooting just 29.2% from beyond the arc in their past three wins. This is one of the reasons why Duke has fallen behind early in its last couple of contests- they start the game taking difficult shots that are not falling and quickly fall behind. The Blue Devils have been saved in conference play by the Plumlee brothers, who have continually asserted themselves as forces on the inside. Mason has been a go-to guy for the offense all season, and Miles has been coming on strong the past few games, so why not feed them the ball in the games opening minutes and let them get some easy points? 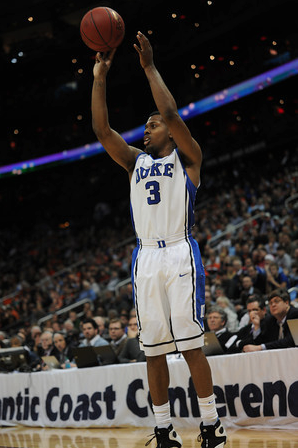 This will allow Duke’s guard to get into the flow of the game before they start shooting long-range shots. Attacking the inside early will open up the perimeter for their shooters to knock down shots later in the game for a knockout blow. Wake Forest is not a very good team. They’re not a very deep team, either. But they do have two of the top scoring threats in the ACC, and will rely on them heavily throughout the game. Junior C.J. Harris and sophomore Travis McKie average 17.3 and 17.1 points per game for the Demon Deacons, respectively. Both of them are capable of knocking down shots from anywhere on the floor. 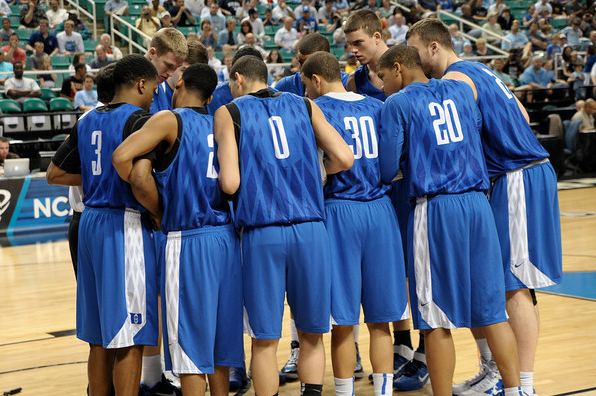 McKie, in particular, presents the most difficult defensive matchup for Duke. At 6-foot-7, he is a bit too big to be marked easily by Austin Rivers or Andre Dawkins, but may propose issues for one of the Plumlee brothers with his speed. If Duke can shut down both of these players, Wake Forest won’t have anyone else to turn to. Only seven players on the Demon Deacons roster average more than 11.1 minutes per game. They won’t go more than eight or nine deep very often, and this team is simply not talented enough to beat you if both of these players are not on their game. Any conference game at Cameron is a good game, so tonight should be a lot of fun. 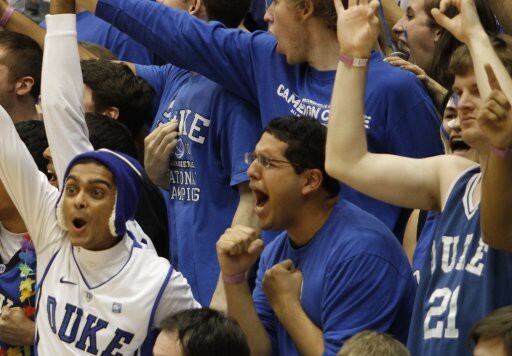 Stay Crazie, my friends, and as always, go Duke! A few weeks ago we took a look at Virginia in our ACC preview, and now it’s time for the Cavaliers to come to Cameron to take on Duke. Although the Blue Devils have been the victors of their last 39 games at home, this is not an opponent to take lightly. Virginia comes into the game with a stellar 14-1 record, won the first conference game, and are ranked 16th in the AP top 25. This should be the toughest test Duke faces at home all season before the Tar Heels come to town on March 3rd. The Blue Devils have struggled in their past two outings, so let’s see what they’ll need to do to beat the Cavaliers tonight. Virginia is a team that likes to play slow, and when I say slow, I mean slow. They are at their best when they grind out defensive games (The Hoos are ranked ninth in the nation in defensive efficiency according to KenPom. Duke is ranked fiftieth). Duke needs to do everything it can to keep Virginia on its toes and uncomfortable as possible, and that means push the ball. 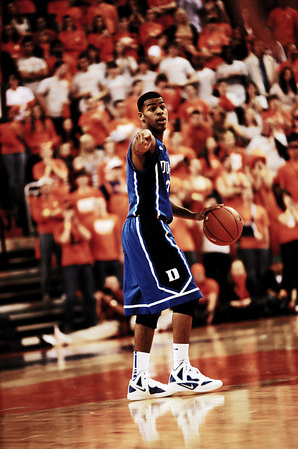 Inserting Quinn Cook into the starting lineup recently should help that. Cook’s quickness and playmaking ability allows Duke to move at a faster pace on the floor than when Tyler Thornton or Seth Curry are running the point. When it all comes down to it, Duke scores 82.1 points per game and Virginia allows 50.5 points a game– something’s gotta give. Duke has only won one game this year when it scored fewer than 70 points, so they are going to need to keep the game moving and push Virginia to do the same. In a year where Duke and North Carolina are considered to be the upper echelon teams in the ACC, it’s hard to think the Conference Player of the Year will be anyone but a Blue Devil or a Tar Heel. 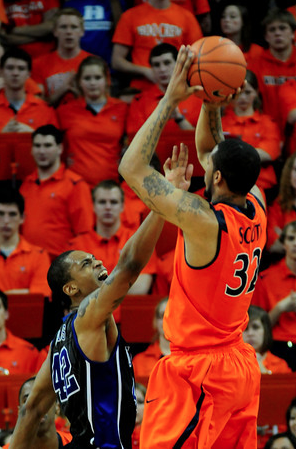 But right now it seems as though Virginia’s Mike Scott is one of the frontrunners for the award. Scott is the go-to-guy in Virginia’s offense, averaging 16.5 points and 8.9 rebounds per game this season. Most recently he paced the Cavaliers with 23 points and eight rebounds in their 52-51 victory over Miami on January 7th. 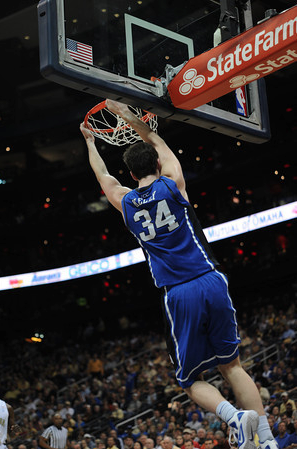 Scott is a dangerous scorer and will look to take advantage of the Blue Devils inside. Duke has struggled with interior defense at times this season. If they want to enhance their chances of winning tomorrow, they need to make someone other than Mike Scott beat them. There’s no better way to make Virginia play a more up-tempo game than forcing them to play from behind early. This was one area where Duke succeeded against Georgia Tech (though they would later relinquish the large lead they had built up in the early stages of the game). The first eight minutes of the game will be crucial ones for the Blue Devils, and will set the tone for the remainder of the contest. If Duke can knock down its shots and jump out to an early lead, it will put Virginia on its toes, but if the Cavaliers stay with the Blue Devils early or jump out to an early lead of their own, we could be in store for a long night in Cameron. There’s no two ways about it- Virginia is not a very big team. They have a 7-foot center in their starting lineup, but they have just one other player on their roster that is larger than 6-foot-8. At 6-8 himself, Mike Scott can play like a big man, but the size differential remains nonetheless. Duke needs to take opportunities to feed the ball down low to Miles and Mason Plumlee, who have played fantastic basketball while Duke has struggled as of late. The unsurprising chemistry between the brothers has really started to kick in, and facing a smaller Virginia lineup, they need to assert themselves early and often. Big players step up in big games, and after struggling in his past three contests you feel like Rivers might be due to break out tonight. It would certainly be a coming-out party for him to explode in a game in front of the home fans against another top 25 team. You can talk about Austin Rivers’ ego all you want, but fact is he is one of the hardest working basketball players in the country, so you know that after three straight subpar performances he is chomping at the bit to show the country what he can really do. 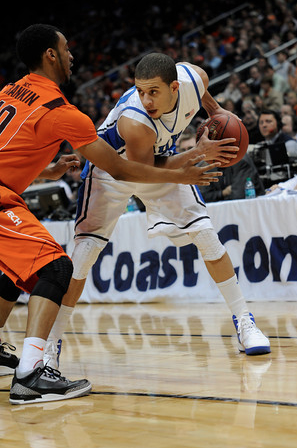 If Duke can get the Austin Rivers we saw in December, they will be tough to take down on their home floor. The best homecourt advantage in college basketball will rear its head tonight. 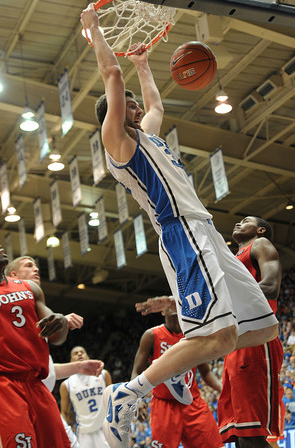 Duke keeps Virginia at a distance for much of the game, with Mason Plumlee pacing the Devils between the blocks.